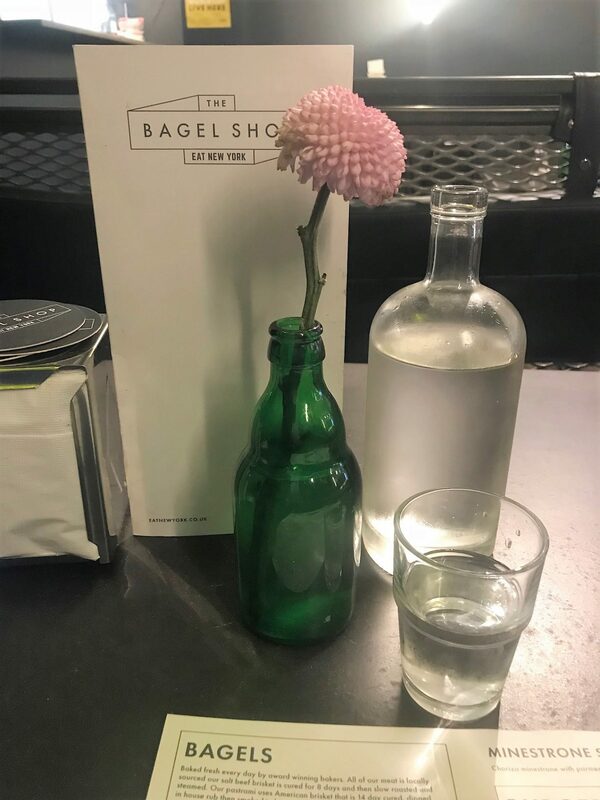 I don’t know about you, but for me, you can’t beat a bloomin’ good bagel, filled with stacks and lashings of delicious fillings. Breakfast, brunch or lunch (hey, I’d even indulge in one for dinner if I could…) they make the perfect loaded meal, as well as being highly versatile. 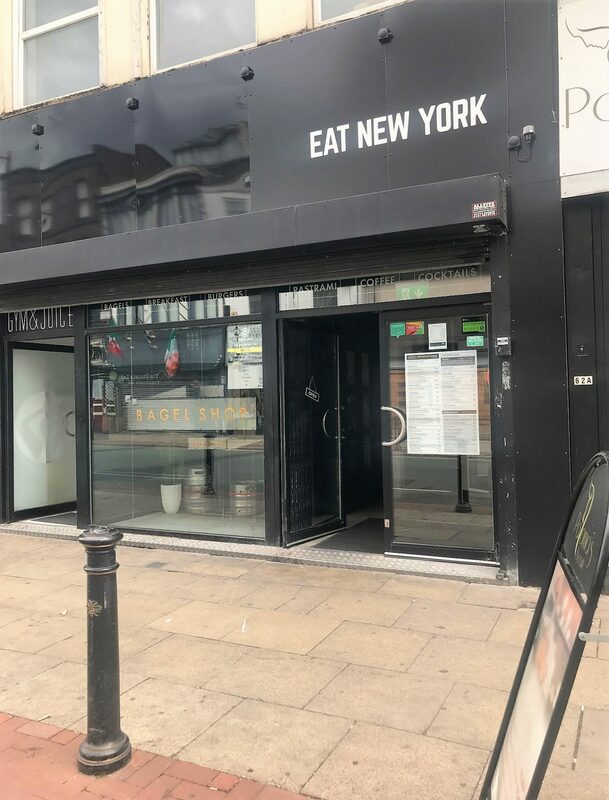 So last week, you can imagine how happy I was to come across Eat New York – a dedicated bagel style eatery in Manchester’s Northern Corner. 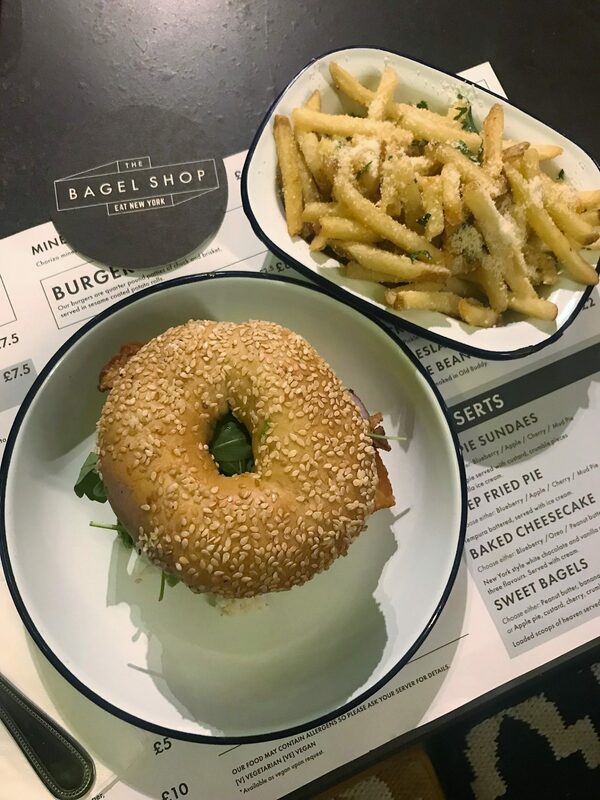 Based towards the top of Oldham Street, ‘The Bagel Shop’ is a brand new street food inspired cafe, serving up NY style bagels to take out or dine in. I arrived last week and took a little booth by myself in the corner of the cafe, bringing my laptop with me to have a bit of a ‘working lunch’. 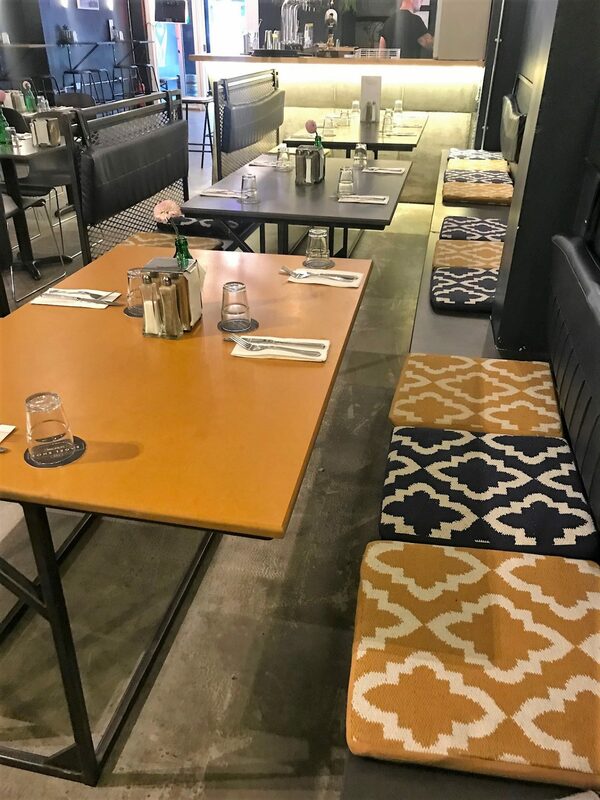 It’s a dark, kind of eclectic little place, that has that urban New York down town feel, yet sits in well with the modern vibe of the Northern Quarter. I browsed through the menu and had a glance at their offerings. Lets start with breakfasts. So, bagels obviously make up a large section of these, but they actually have a lot of other impressive offerings too. I mean, you’ve got the Pastrami Hash (with a poached egg and brown sauce) and Pastrami Benedict, Corn Cake and Avocado Stack (with grilled tofu and piled up on rye), pancakes and a House Breakfast Tray along with a Meat Free House Breakfast Tray (think Sausage patty, Pastrami, streaky bacon, breakfast potatoes, tomato, house beans, black pudding, mushroom, fried egg, toasted rye… YES!). Then of course, you’ve got all your New York style breakfast bagels. 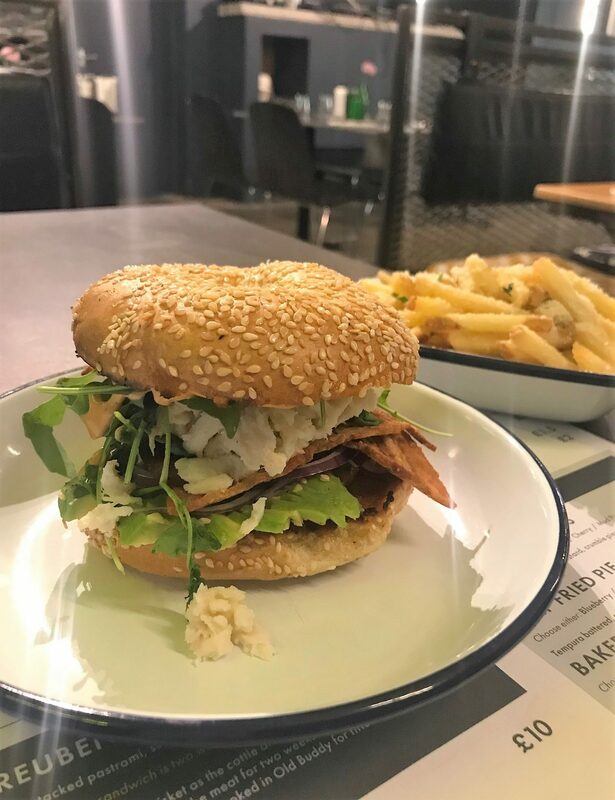 For lunch, you can pick from burgers, bagels, salads and fries. 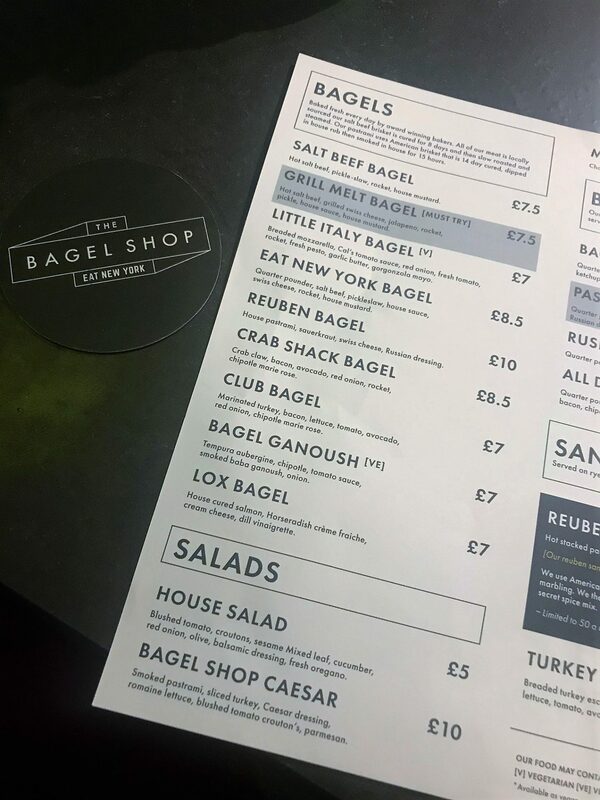 I would touch on the fact they do a soup too, but lets face it, unless you’re dipping your bagel into a soup, you’re probably going to skip by this option and go for the much more ‘bigger’ offerings. After all, this is one hell of a loaded bagel place, complete with dirty fries and all the toppings. 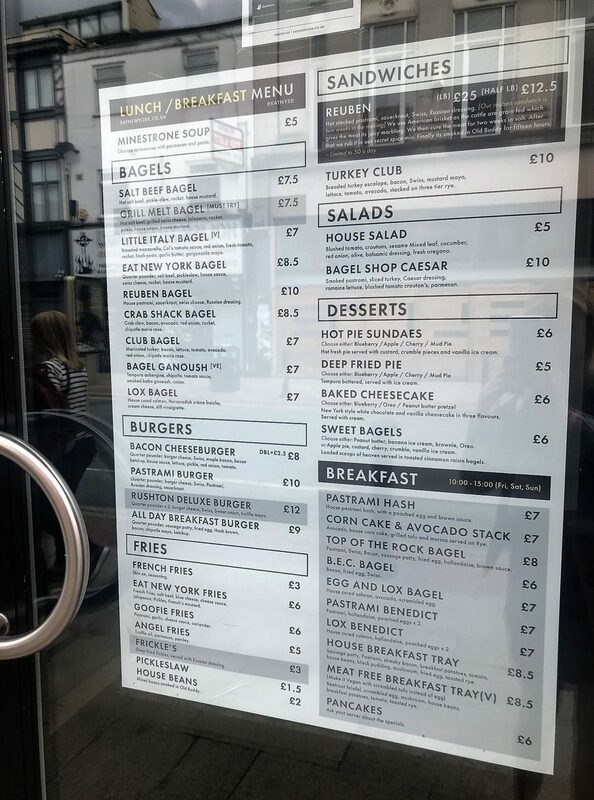 I went for potentially the most expensive bagel on the menu (not intentionally, but I spied crab meat and avocado, and nothing is ever gonna beat that), which was £8.50. 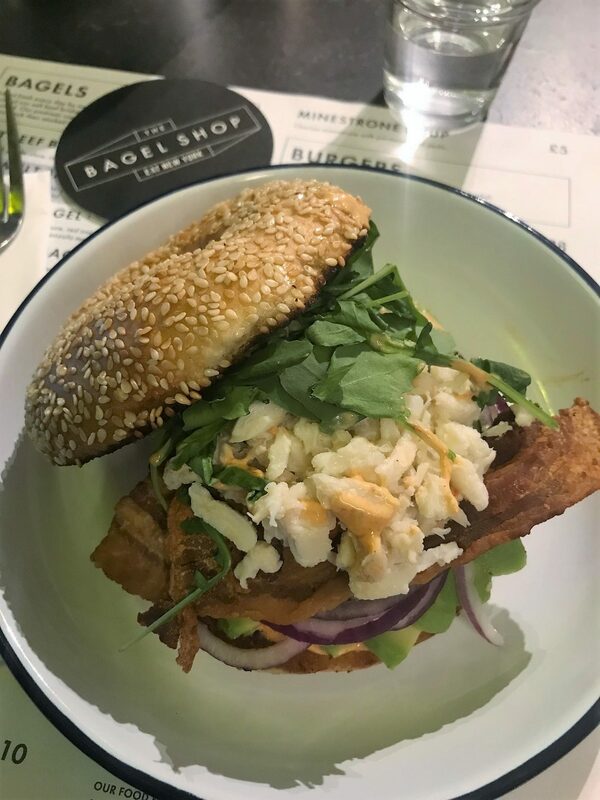 The Crab Shack Bagel features crab claw, bacon, avocado, red onion, rocket,chipotle and marie rose sauce, in a toasted bagel. It’s BIG. 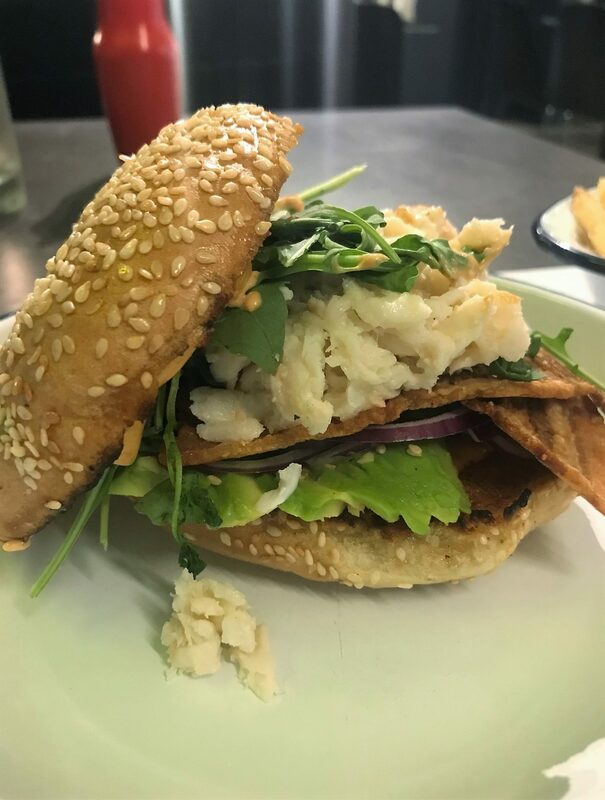 I mean, think plenty of crab meats all piled up, with huge wedges of avocado and bacon slices piled up inside and around the bagel. 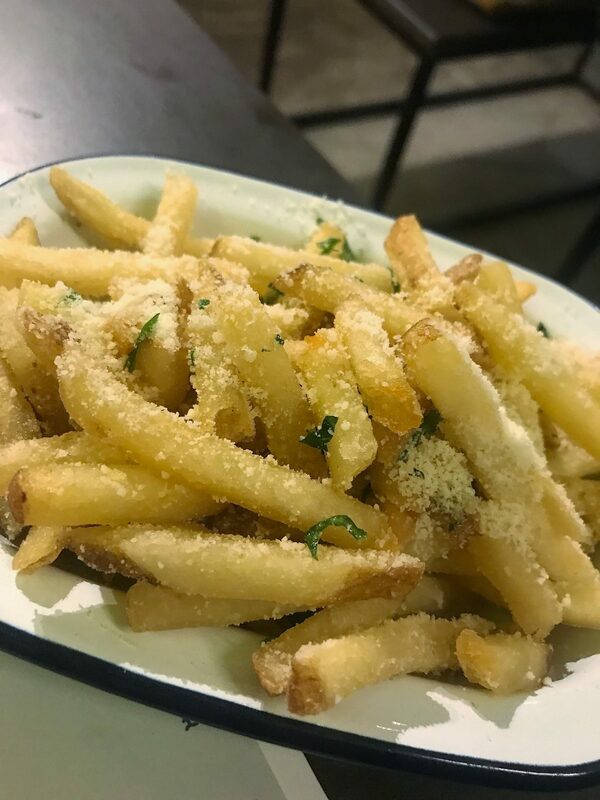 .If you wanted something a little more ‘wow’, then the Eat New York fries sounded pretty special. They come with salt beef, blue cheese, cheese sauce, jalapenos, Pickles, French’s mustard. MMMMM. 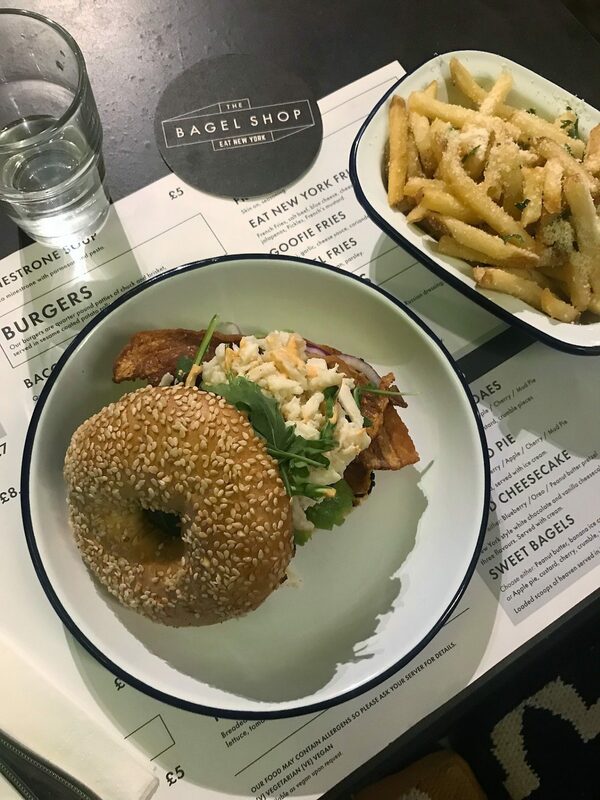 Some of the other tempting bagels included the Bagel Ganoush (Tempura aubergine, chipotle, tomato sauce, smoked baba ganoush and onion), and the Little Italy Bagel (Breaded mozzarella, Cal’s tomato sauce, red onion, fresh tomato, rocket, fresh pesto, garlic butter, gorgonzola mayo.) But you can check out the full menu here. 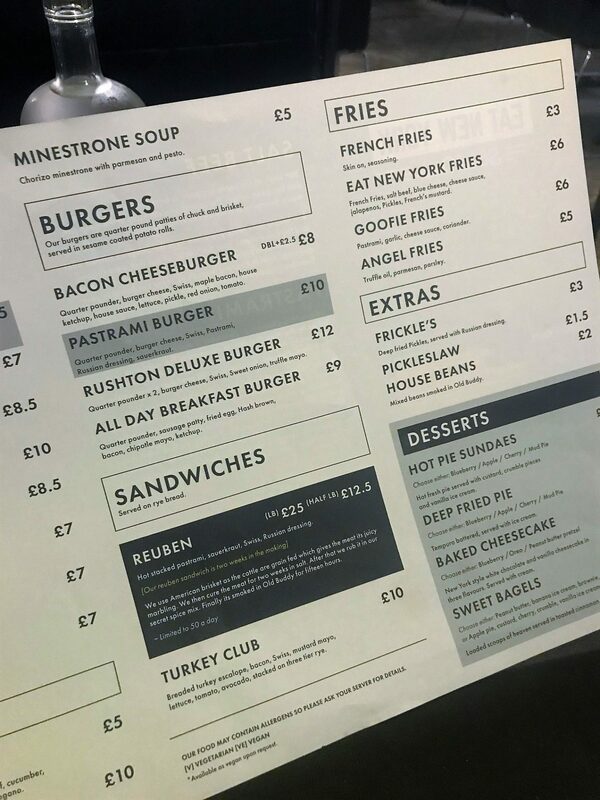 Prices are reasonable for a new Northern Quarter eatery, with burgers and bagels ranging from £7-£12, with the bigger, meatier ones sitting more at the top end. 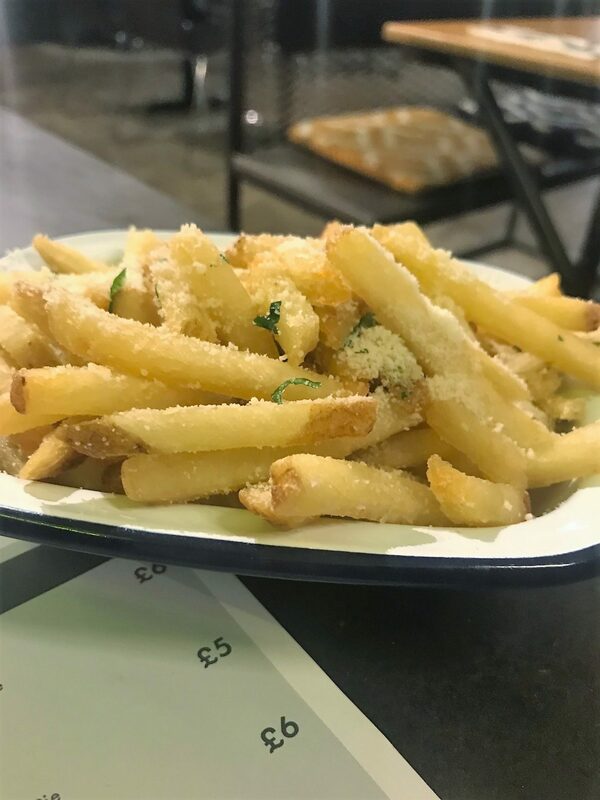 The fries come in at around £3-£6, depending on toppings again. But let me tell you – portions are massive and you won’t be leaving hungry. I must try this place out! thanks!